We've been busy over the past few weeks and weekends for Universal Piling at Langley station, near Slough in Berkshire. 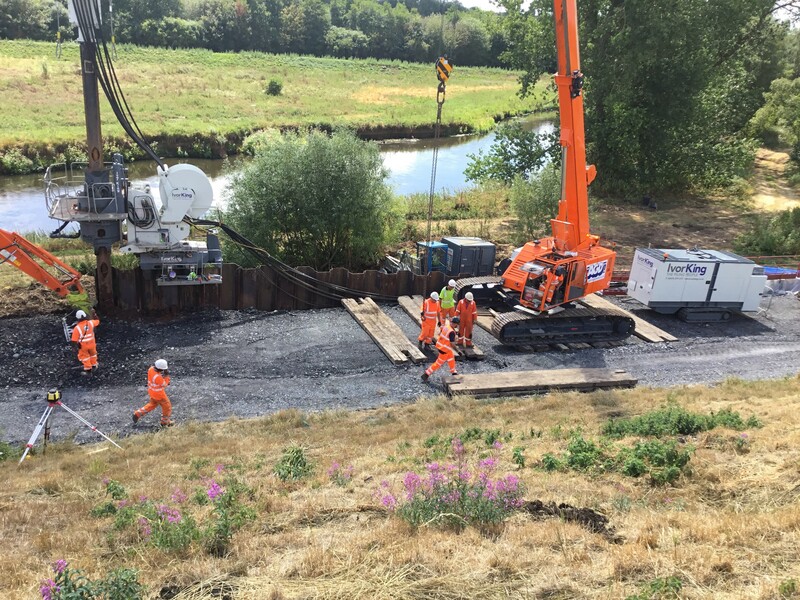 The task was to install a line of 8 m long L606 'U' profile sheet piles alongside a railway line through tough soil conditions in extremely restricted access. Giken CB2-5 7 tons capacity clamp crane (the crane "walks" along the previously installed sheet piles behind the Giken F201 once again due to lack of access for a standard crawler crane to work). The first hurdle was to lift the equipment into the site from a compound over the station perimeter fence. This had to be done during possession hours on Saturday nights. 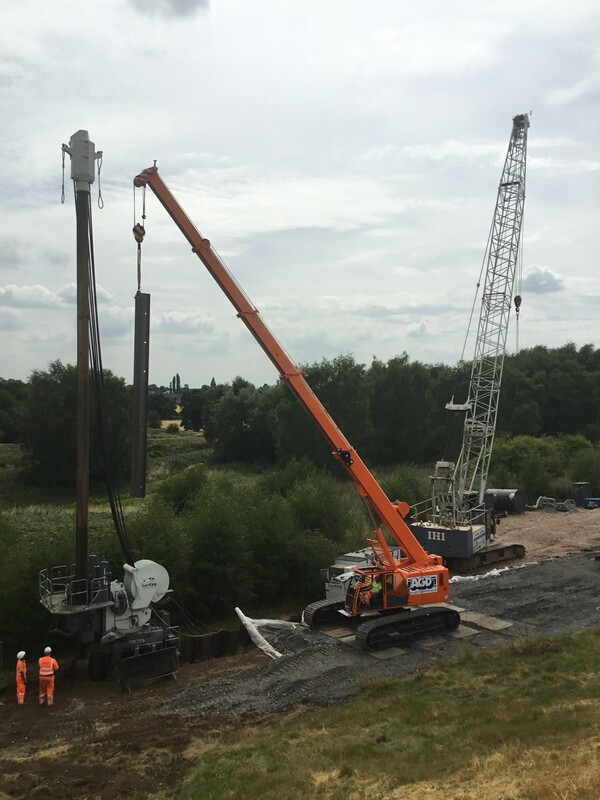 Once in to site the Giken F201 installed the first few piles using a mobile crane to pitch the piles, and then the clamp crane was lifted in and continued along the line behind the silent piler until the job was completed. 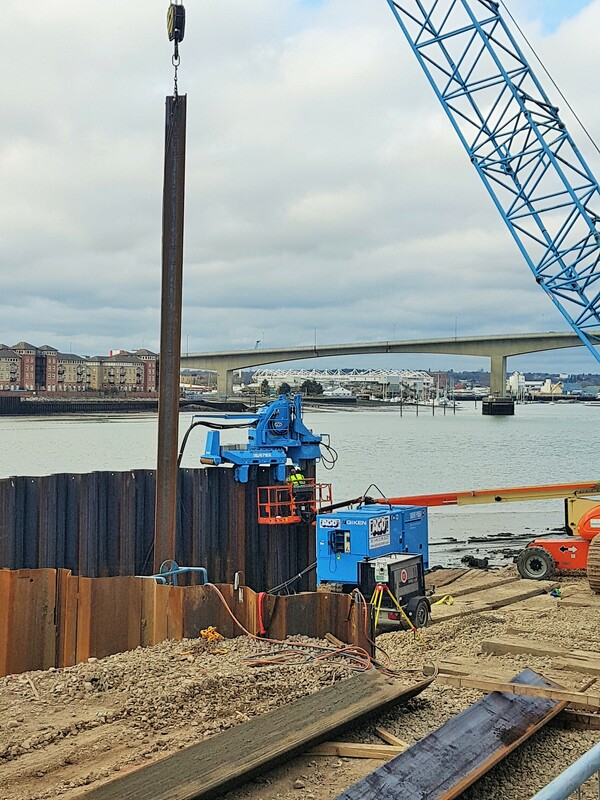 Once the last pile was in the clamp crane and F201 silent piler "walked back" along the previously installed piles and were lifted back out during another weekend possession. All in a days (and nights) work for the AGD team! If you have a sheet piling project with access problems or hard soils, Giken offers the right solution. Contact us for sales or rental enquiries. The NCB FD200 CFA rig has a 20 ton metre torque rotary head, can drill a max diameter of 900 mm up to 24 m deep, 360 degrees around the tracks, is equipped with a pull down winch of 5.5 tons, a powerful 400 hp engine, and weighs 59 tons. 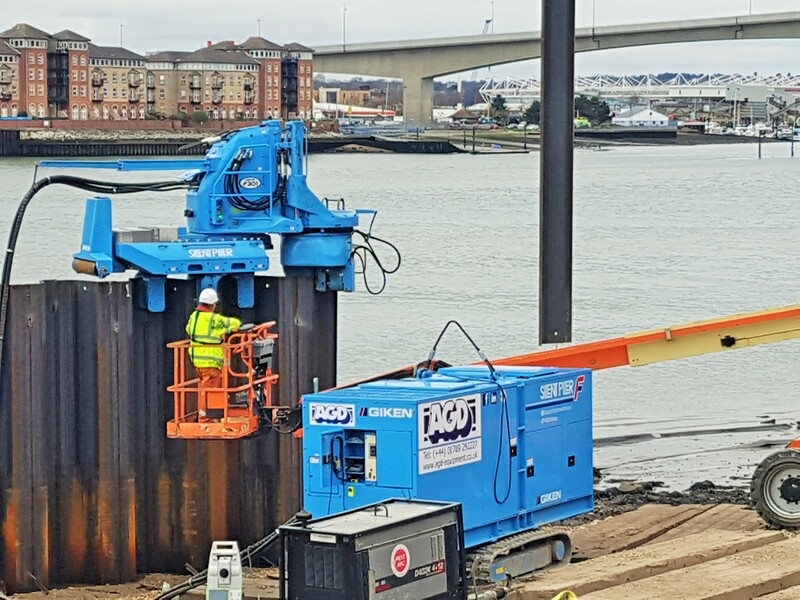 It is pictured here working in Stratford, east London installing 350 mm diameter displacement piles to approx. 8 m depth through dense soils and producing outputs of up to 100 columns per day. This extremely compact and lightweight machine was specified for its ability to be lifted into the basement with the smallest crane possible. It was delivered and lifted into place early on a Saturday morning and went straight to work. Within 2 days of being on site and having shown its versatility a second unit was ordered and delivered the following Thursday. These cranes are proving so popular up and downthe UK we've ordered more. The next one arrives shortly. Watch our news section and subscribe to our Social Media channels for further updates. You can view a video of the machine being lifted into site by clicking on the link below. Flashback Friday! Photos of one of our IHI CCH300T telescopic crawler cranes on a site in Belper, Derbyshire in 1996 for Ivor King Piling. As you can see we were no strangers then to supplying sheet piling equipment and crawler cranes to restricted access sites. The hydraulic retractable undercarriage on this machine really coming into its own when accessing the site. In those days this was truly pioneering especially being a telescopic machine rather than a traditional lattice boom crawler crane. You may also note that the vibratory hammer was piped up to be powered by the crane. This was pure innovation. Saving on the need for a separate power pack and the crane operator could handle both machines resulting in labour savings too. Lastly and by no means least this bit of history also demonstrates the strength and depth of our relationships. We have been doing business with Ivor King Piling for 25 years and this is reinforced today by the number of machines we have sold them. No less than 17 machines, including crawler cranes, silent pilers, CFA piling rigs and telescopic leader rigs have been supplied over the years. A truly remarkable journey and one we will never forget. We are proud of our heritage. It may also be supplied with a water jet pump, super jet reel or supercrush equipment for harder soils including rock. We are celebrating the sale of the 6th Giken silent piler to our esteemed customer Ivor King Piling. This particular model is a Giken ECO700S super crush piler and is pictured here working at Minworth Sewage Treatment Works in Birmingham. The machine is installing 750 linear metres of sheet piles up to 11 m long in tough soil conditions. Further involvement in the project from AGD includes the supply of all the cranes required for the job. 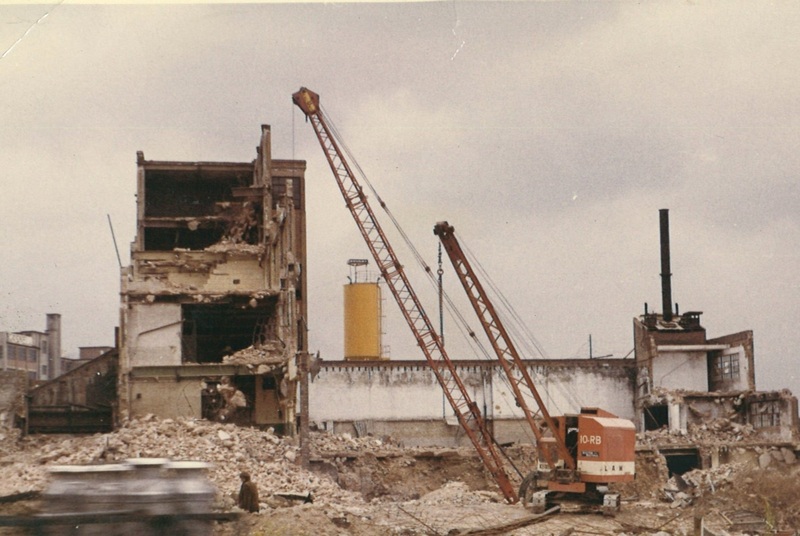 The 70 tons IHI DCH700 crawler crane was actually the first machine ever sold by us to Ivor King and helped us to develop a relationship that has extended over 25 years. We also hired a 25 tons Marchetti Sherpina telescopic crawler crane and Giken CB2-5 7 tons clamp crane. The clamp crane walks along the piles following the Giken as it advances making it ideal for working in restricted access sites. In this case the restriction was working weight so the telescopic crawler crane was switched to the clamp crane as the works progressed. Click here to read a case study and click on the link below to watch a video of the project. Whatever your crawler crane and piling equipment requirements - call AGD. The only number you need.